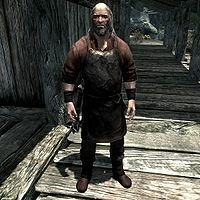 Filnjar is a Nord blacksmith that lives in Shor's Stone. He spends most of his day working at his forge before going to bed at midnight. He can be bartered with and has a base amount of 500 gold. He sells various Smithing items, armor, and weapons. He acts as the town's unofficial leader and enlists you to clear the Redbelly Mine of frostbite spiders that have recently infested it. He has great faith in the mine and believes there is more to be discovered than what they've tapped into thus far. Upon raising Filnjar's disposition, he will become a potential candidate for marriage. He wears a typical red blacksmith's apron and a pair of shoes. He carries a leveled mace (up to elven quality), a key to his house, and a selection of common items and gold. Filnjar starts off his day at 6am and spends an hour resting in his house. At 7am, he goes outside to his porch to work on the forge for most of the day. After twelve hours of working, he finally stops and heads back inside his house to consume his dinner for an hour. At 8pm, he sits around the campfire in the middle of town for four hours. At midnight, he heads back home for six hours of sleep, and repeats his schedule the following day. When greeted he will talk about his small town: "If you're looking for supplies, I'd advise heading to Riften." and "What brings you out to Shor's Stone?" If you ask him to tell you about the mine, he will respond: "Redbelly Mine gets its name from the red mist filling the place. You get used to it after a while... kind of smells like the hot springs out in the tundra. No idea what's causing it though." When exiting conversation, he'll say: "Don't kid yourself... stone runs in our blood." During Truth Ore Consequences, Hafjorg in Riften will tell you to pick up an ore sample from Filnjar and return it to her. When you tell Filnjar you are here for the ore sample, he'll say: "It's about time; I sent them a letter weeks ago. That Elgrim... he'd forget his own pants if his wife didn't help him dress. Here you go. Tell Hafjorg that she can chip off whatever she thinks is a fair trade for their time." You can now ask him about the ore sample, gaining the response: "Redbelly is supposed to be nothing but an iron mine. Been working it for years. Then right before the spiders had moved in, we found that chunk of ore. Never seen anything like it. I want to know what I'm dealing with before I start tearing it out of the ground." When you first meet him, he will grumble about the sorry state of the mine: "I hope you haven't arrived here looking for work in the mine. ", "Sorry, the mine's dry right now. ", and "I hate seeing a good mine go to waste like that, you know?" When asked about what is wrong with the mine, he'll bluntly tell you: "It's full of spiders, that's what's wrong with it! Almost killed Grogmar and me when they showed up. I'm worried that they'll come out of the mine looking for food soon... then we're in even bigger trouble." If you ask if the local guards will help, he'll bitterly explain: "They're as useless as a fifth wheel on a wagon. Gave me some sort of a line about "keeping an eye out for enemy soldiers." What's the point in protecting this place if the mine's completely useless? Idiots." If you offer to help, he'll say: "Tell you what. Keep to your word, and I'll line your pockets with as much as I can scrape up." If you tell him you'll pass on the opportunity, he'll be disappointed: "I never asked you to help in the first place. Why would I? Everyone in Skyrim only helps themselves." If you ask about the spiders infesting the mine, he'll tell you: "Moved right in and made themselves at home. Did it overnight. I'm not even sure exactly where they came from. No one's been hurt yet, and they seem to be staying in the mine, but who knows how long that will last? If we can't get back into the mine, our town is sunk." As you are leaving for the mine, he will express concerns for your life with the remark: "I don't want to be responsible for sending you to your death. Be careful in the mine." If you greet him before you kill the spiders, he'll comment: "The spiders put you through the ringer?" and "Nasty little buggers, aren't they?" After you have cleaned out the mine, you can give him the good news: "Gone? Every one of them? Why, that's incredible." Or if you cleared the mine before talking to him about the spider infestation, you can notify him that you already cleared the mine: "Wait... you mean you killed every last one of them? I can't believe it!" Either way, he'll then say: "Finally, we can reopen the mine and put Shor's Stone back on the map! Here, please accept this gift as a token of our gratitude." When you talk to him again, he will be quite optimistic: "The mine will be running better than ever thanks to you." Filnjar: "How are your parents faring, Grelka [sic]? Doing better than we are I would guess." Sylgja: "It's no feast in their neck of the woods either. Last time I was up there, father said they were barely scraping by." Filnjar: "This civil war is taking its toll on all of us. Miners are some of the hardest hit." Sylgja: "That's what scares me. I'm afraid I'll travel to Darkwater Crossing and find it burned to the ground." Odfel: "You think living with Grogmar is easy? Did you see how he lives?" Filnjar: "You two will just have to learn to get along until we can build you another house." Odfel: "At this rate that'll never happen." Filnjar: "Quit your bellyaching. We've all got our problems." Grogmar: "I've been cracking rock ever since I was able to hold a pickaxe and I'm telling you, this mine is drying up." Filnjar: "And I'm telling you, you're wrong." Grogmar: "What makes you so sure? What if I'm right?" Filnjar: "I know there's ore still in there, I can smell it. If you think you're right then you can pack up and leave any time you like." Mine or Yours: Help Filnjar by ridding the Redbelly Mine of frostbite spiders. This is the merchandise found in Filnjar's Merchant Chest. These items are only available if purchased from the merchant; they cannot be pickpocketed or stolen. They are restocked every two days. This issue has been addressed by version 3.0.1 of the Unofficial Skyrim Legendary Edition Patch; he can now be invested with like other shopkeepers. Watch out - he may be killed by the local wildlife or the spiders from Redbelly Mine. Esta página foi modificada pela última vez à(s) 05h41min de 11 de fevereiro de 2016.